Need for Speed has hit the App Store three time now with the original release of Undercover and then the incredible Shift and now Hot Pursuit. Each game has got better and better, so this shouldn’t be an exception. Firstly I must point out that in this NFS game you are playing the role of the cops not going undercover pretending your a cop by street racing with the criminals in order to somehow obtain secret info. Instead you have a marked car with the sirens and full whack and drive like a maniac in various events. The main event and most fun to play is Intercepter/ Tough Justice. To catch the bad guys you simply need to knock their on screen health bar down to nothing by inflicting damage and pain. The target cars can be a real challenge to catch with approaching vehicles getting in the way and the criminal being faster than you so simply smashing your car into theirs only works for somewhat of the time. So you will need to start and think tactically with your armoury of weapons which include deployable road blocks, spike strips and EMP. The spike strips are only useful when your in front of the enemy car, the road block is useful for slowing down a car in front of you and the EMP zaps the in front vehicle causing it to slow down and loose use of it’s nitro and special abilities. The controls are very simple to use with auto accelerate always turned on, braking being operated by sliding your finger down on the screen and you swipe your finger upwards to activate the nitro similar to Undercover. Steering is controlled by the accelerometer and to activate spike strips ect you touch there icons on screen. The controls were easy to use and worked well but you can’t choose an on screen steering wheel along with a manual accelerator which may annoy some. The graphics are great with some environments looking better than others and not to give all the environments you drive in away, the desert scenery is bar none the best graphically. Car animation is fluent along with smashes and crashes with criminal vehicles, the textures and colors on the cars is also very detailed. Overall the graphics are very good. Sounds of cars are all different which is defiantly nice to see, you have beefy engines to quiet engines to hear throughout the game. The crashes all sound very realistic too and the music selection seems to be hand picked for fast paced police chases. 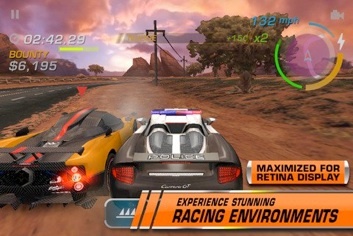 Overall Need for Speed Hot Pursuit packs a lot of fun inside with over 24 events to play through in various locations alongside great graphics, controls and a nice selection of cars this is yet another fantastic Need for Speed release upon the App Store.